Despite the fact that here in the U.S. we’ve been experiencing what some are calling a “Winterless Wonderland” due to the record-setting lack of snow in parts of the country, we are still entering the high season for winter sports. 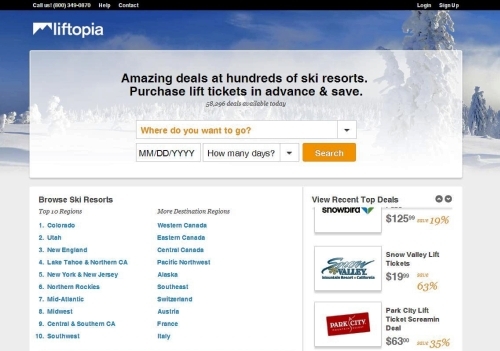 And for those of you within driving distance of slopes where you don’t have the fear of plowing into exposed patches of dead grass while heading downhill, we once again recommend checking out our favorite tool for finding discount lift ticket deals on the web, Liftopia.com. Every year these guys keep upgrading the site’s look and feel, and searching either by region, date or clickable map makes finding deals intuitive and fun. It’s also worth checking in on the site periodically for the daily deals that are highlighted on their front page, with deals as high as 81% off certain destinations. 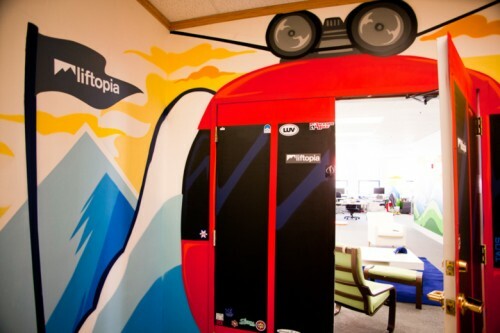 Also, for all of you stuck in cubicle-laden non-tech-start-up boring office spaces, take heart in Liftopia’s awesome digs where offices are decorated to look like you’re entering a gondola (see above). This is way more fun than TheExpeditioner.com’s offices where our offices are just areas of a large room where we’ve taped to the wall notebook paper with the word “office” written on it. Venture capital funding always welcome.